A Fathers for Justice protester who caused traffic chaos after spending a week camped above the Tamar Bridge has walked free from court. The prosecution at Plymouth Crown Court dropped the case against Jolly Stanesby, saying there was not a realistic chance of a conviction. Business leaders said the protest had caused delays and frustration. 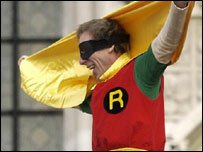 Mr Stanesby, 39, of Ivybridge, Devon said he wanted to draw attention to the plight of fathers. 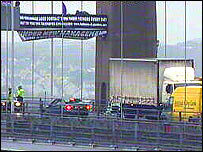 Long tailbacks resulted on both the Devon and Cornwall sides of the Tamar Bridge when Mr Stanesby and other protesters climbed onto a 20ft-high gantry on 23 January. Devon and Cornwall Business Council said the delays had lost £5m of business. "There is a tremendous amount of anxiety and anger about this, particularly among small businesses," said chairman Tim Jones. Mr Stanesby, who had been accused of causing danger to road users, said after the case: "I do not see it as causing a lot of inconvenience. They didn't close the roads. "I feel very strongly about these views and the general public need to know what's going on." A Devon and Cornwall Police spokesman said: "Each case is considered on its own merits and the Crown Prosecution Service will be made aware of any new information, even if it does not support the prosecution. "We will look closely at the circumstances of this case to see what we can learn to help us deal with this type of protest in the future".